the whatley wild days: Sweet Home Alabama! Week 4: This has been a week full of fun and friends and best of all HOME. We spent the whole week in Birmingham, and what a fun week it was spending time with friends and family. After a weekend full of celebrating Maggie's 1st birthday we headed up to Birmingham to get ready for baby Caroline. Mary Virginia was in art camp up at our church - they made all sorts of art and it all had to do with sweets and candy! She was in heaven as you can imagine! The biggest news of the week was sweet Caroline! We have had so much fun getting to know that sweet baby girl! I guess since we try to have a new experience each week now that we are living in Baton Rouge, our experience for the week was holding a brand new baby girl! The kids have loved getting to meet Caroline and hold her (and no, neither of them want a baby sister of their own). We were able to spend lots of time with our friends, which meant so much to Mary Virginia and John Bay. They miss everyone so much. 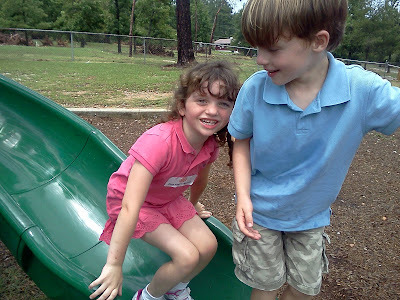 We played at the park with the Verners - even though the playground was extremely wet, it didn't stop these kids! The smiles when MV and JB saw Gage and Lanier pull up were priceless. They played so hard that we were all exhausted once we got home! Lunch dates: As you might have read in the previous blog...on Tuesday, we took Ella out for a little lunch date and big sister celebration. I admire those out there that have three kids. It was all I could do to keep up with MV, JB, and Ella! Thank goodness we met my parents for lunch and then all of the Bagbys showed up too! It was so nice to spend time with dear friends! We were able to sit down with "Ms. Jeannie" for a quick bite of lunch. She was so sweet to bring the kids a surprise! 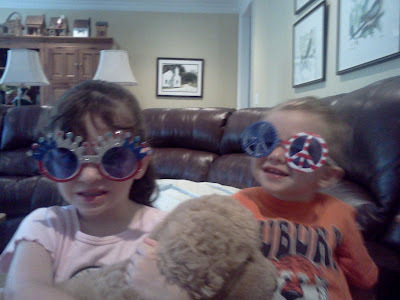 The love their sunglasses and can't wait to wear them on the 4th! She is now Mary Virginia's new best friend...MV couldn't stop talking and telling her all kids of stories! It is so fun for me to see my kids spending time with Jeannie, she was a part of so many of my childhood memories! Our lunch on Friday was probably the wildest of the week! We me the old neighbors for lunch...where else, but Chick-fil-a. MV and JB were so happy to see the Huntons and Stoffregens - they had been talking about it all week and have not stopped since! 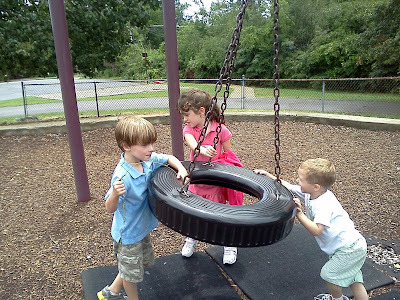 The kids were so happy to be together again and it was just as wild and crazy as always! 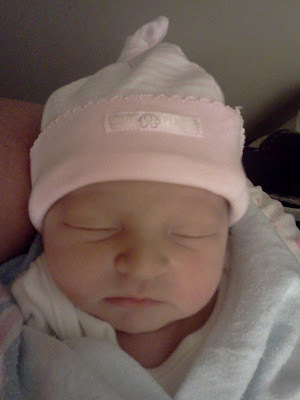 I was also able to spend some quality time with Allison and Caroline in the hospital. We were able to catch up, Craig got to spend some time with Ella, and Elaine got a well deserved break! (Thank you mom and dad for keeping the kids so that I could stay with Allison.) 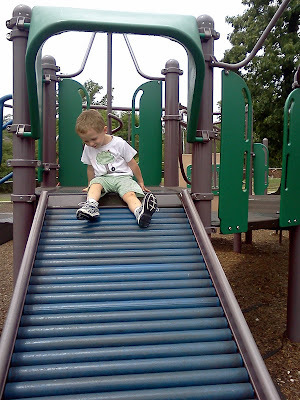 It has also been fun playing in "Youngblood Park". I am grateful that Craig and Allison have felt like having visitors since they have been home, especially adding two more kids to the mix - we have had lots of energy to burn in the backyard! Sunday, we were able to go back to church and see all of our friend there! You really don't realize how lucky you are until things are gone! I have missed our Sunday school class, our friends, and Dr. Furr...really the whole church! It was so nice to be able to go back, even if it was just for a visit. The fun didn't stop at church, we also had another birthday to celebrate! Happy Birthday, John Robin! We loved seeing batman and playing at the pool to help celebrate! 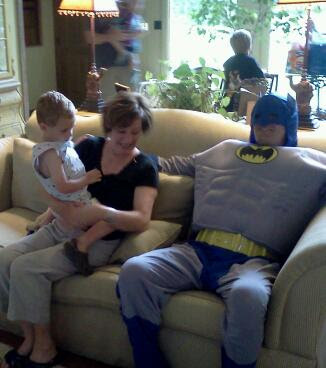 As you can tell, JB wasn't too sure about batman! 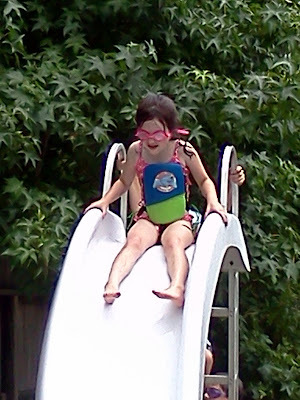 MV on the slide at the pool! She was not scared at all! We are heading back to Cajun Country, Bandit is getting ready to make his Louisiana debut and mom and dad are coming with us for a visit. I can't wait to fill you in on our adventures next week - and to introduce mom and dad to all that Baton Rouge has to offer! Just a hint...we are thinking that we are going to pay Mike the Tiger a visit - of course, we will be decked out in our Auburn gear!